Are you a ‘wedding person’? Do you find yourself holding back the tears, trying not to ruin your mascara as you exhale and try not to be overcome and start sobbing into your bubbly? Last week I went to my cousin’s wedding. My beautiful cousin married the love of her life, another woman. My god, it was beautiful. So beautiful it’s difficult to put to words. The ground we gathered on in the Australian bush was warm, earthy and solid, despite it’s illegality. The words shared were genuine and deeply heartfelt. They fell on our open ears, passed through our warmed hearts and dropped softly out our blue-green eyes. 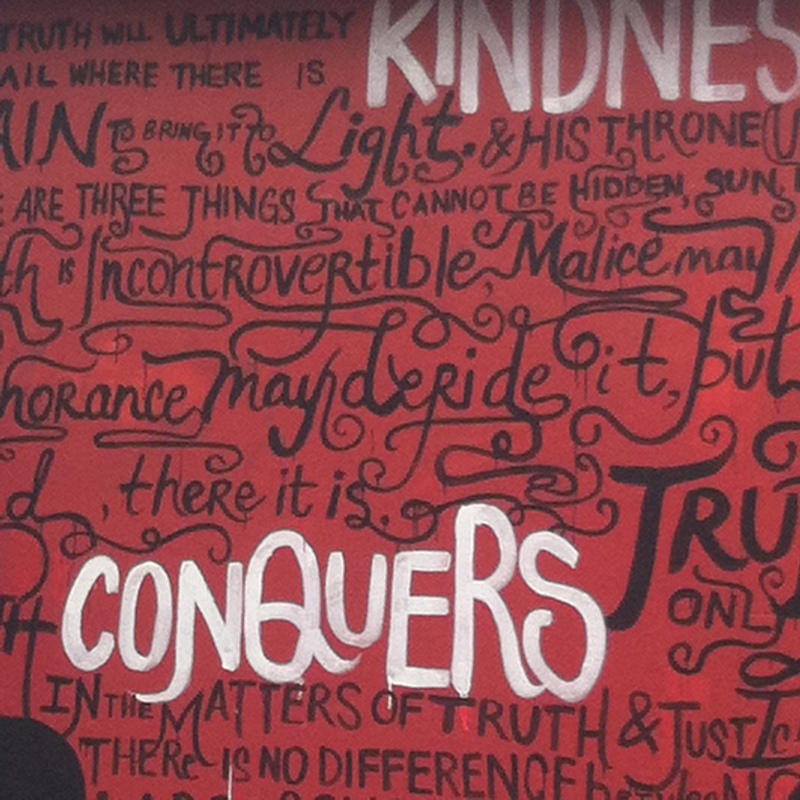 The love being celebrated was palpable, grounded in respect and delightfully joyful. Another cousin and I sat on the wooden bench in the sun-drenched natural rock cathedral, white-trunk gumtrees gently swaying overhead, dusty toes beneath our thinly strapped dresses, shoulders warmed in sun and us giggly waiting for ladies in white to arrive. I always get nervous for the wedding-ees at this point, walking down that aisle with all eyes on them. But as soon as I saw my cousin and her wife-to-be walking with their dads and their 3 month baby girl all cuddling down the aisle, I exhaled. Beautiful. Cue: tears. Each moment then and after was love-filled. 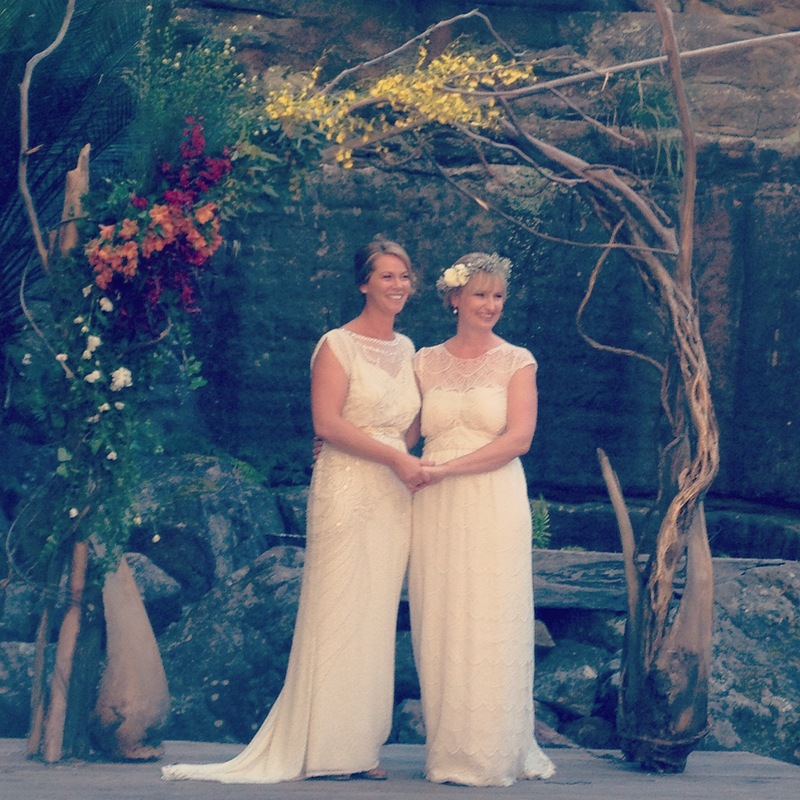 The ceremony took place at one end of the natural cathedral, the women standing tall on a raised rock at the end, framed by a hand-made alter, lovingly made from plaited tree branches and weaved wild bush flowers. Free from the requirements of legal weddings, every word was blissfully true, un-encumbered by legislative rumblings, just requited love in its purest form. A commitment of self to the other and to their life ahead as “us”. A big party followed of course. 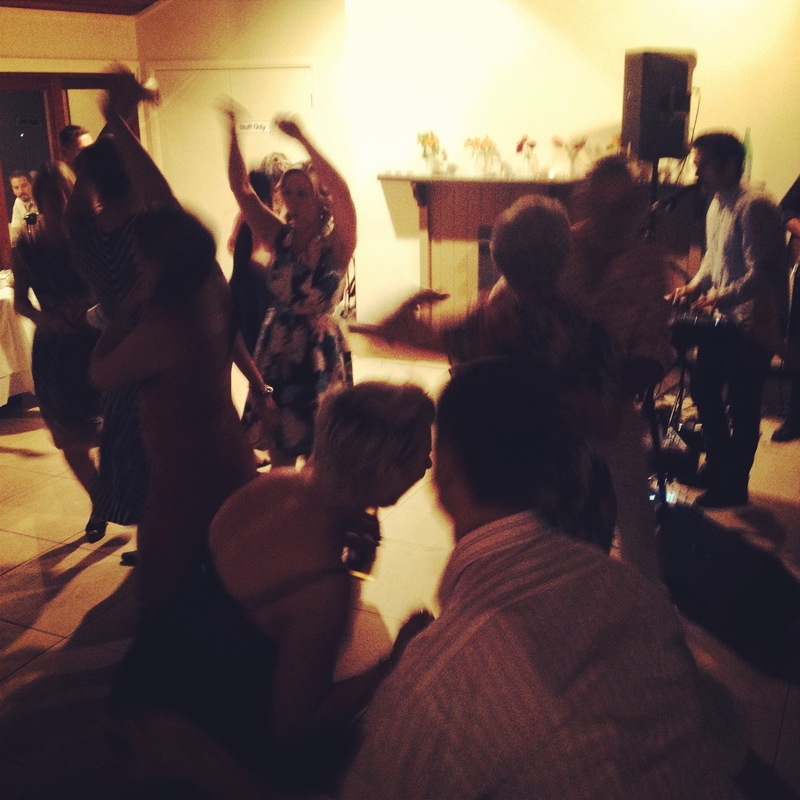 The speeches were strong, the food divine, the grappa shared and the dancing wild. Kids ran amok, aunts danced with new in-laws, and one of my little cousins became overly wine-induced excited about the fact that all our family have exactly the same eyes. She would run up to another relative, yell “let me see your eyes”, stare them out, claiming loudly how she couldn’t believe we all had the same eyes. Blue-green, with a tinge of hazel, and quick to shed love-tears. That same cousin and I were sitting together during the speeches. I’m not sure at what point the love and beauty became too much for me, but I turned to her and said “I think I want a gay wedding, its so damn beautiful!”. Her response was immediate and emphatic, slamming down her glass in agreement “Oh my god, me too!”. We laughed at our own excitement and being so overcome with the love in the room. There is something deliciously stunning about love without any requirements, borders, restrictions. Love that grows from giving love and being loved right back. Have you heard of Christopher McCandless? Or the film and book Into The Wild? McCandless is the main subject of the story, his life and death explored by author Jon Jon Krakauer. It’s an exploration of the human desire to shake off the perceived chain of materialist society, burn your cash and live a life emerged in the wilderness. McCandless tramped around North America for two years before surviving in the Alaskan wild for about four months, alone. It’s believed a previously unknown toxic seed took his life while living off the land in Alaska. McCandless’ story is not simply a story of losing oneself to the wilds, and not just an attempt to “find oneself”, but it is a hopeful journey about following the magnetic pull of your life, right into the depths of the wildest interior of land and self. Krakauer talks of McCandless wanting to “test himself… in ways that mattered”, being “drawn west past the edge of the known world, by nothing more than a hunger of the spirit”. McCandless read the likes of Jack London and Tolstoy on his journey, aiming to live his life according to “truth” above all else, in harmony with nature, new horizons and himself. How indulgent and life-affirming to literally walk into the sunset every evening, rise with the sun in the morning and move each day only in the direction of your latest mood or survival need. Do you ever wish for this? In some ways, I wish to do this. Yet I now know that the pull of sharing life with others is too great for me to wander all alone. Over the past month I have been given the chance to explore this reality in a mini version. I did not burn my cash or travel light that’s for sure, and European hotels are unfathomably far from McCandless’ walk across North America. Yet I tried for about six weeks to live without definite direction or desire other than to explore new spaces and follow my mood and survival needs. I moved through the struggle of my need to constantly have a plan, and at times was overcome with the ever fortunate yet debilitating condition of option anxiety. By the end I understood some of the conclusions that McCandless had come to, primarily being: nature is supreme; survival is not always easy; the spark of new beginnings is unbeatable; and the warmth of close relationships is crucial to our well-being. It’s this last point about relationships which has been on my mind a lot lately. McCandless made one attempt to walk back to civilisation before he was poisoned, but his path out of the wild was cut off by an impassable river. On returning to his camp to wait it out he wrote about the experience of loneliness, and his desire to re-enter the world, return to his family and friends, to re-connect. “Happiness only real when shared”, he wrote. This was in direct opposition to his previous experiences of profound peace while alone in nature. McCandless was experiencing the freedom-intimacy dilemma acutely. It has lead me to many questions. Whether your “freedom” is travel or some other personal desire, it seems these are questions we could all relate to. How can we explore this world without limit, while maintaining our connections to our closest kin? How to allow your feet to walk freely, while strengthening our tightest bonds? The self-indulgent answer is take all your people with you, to be pulled magnetically in the direction of your desires with your loved ones by your side. If only we all wanted to go to the same places at the same time! Thanks to all the people who have joined me on this journey so far, moments with you were by far the most life-affirming. “There are no events but thoughts and the heart’s hard turning, the heart’s slow learning where to love and whom. The rest is merely gossip, and tales for other times” – Annie Dillard, Holy The Firm.